Winter is grudgingly giving way to spring in Lancaster County, Pa. Soon, the fields will be plowed and flowers will bloom. Next Monday will mark the six-month anniversary of the Amish school shooting. In coming weeks, children will begin attending a schoolhouse built to replace the one where five little girls were shot to death. The killer, Charlie Roberts, allowed the teacher and the boys to flee. It was the girls he wanted, but the police came too quickly. So Roberts shot the girls and then killed himself. The Amish had five little girls to bury. Several others had been hurt badly. They asked the media to respect their privacy, but wanted the world to know that Charlie Roberts was forgiven. Herman Bontrager grew up Amish. The Amish here know him and trust him. He even worships with them. He said the experience has tested their faith. "Forgiveness is something that the Amish, they think about it every day … It is shaking," Bontrager told The Early Show co-anchor Harry Smith. "I've heard them actually being willing to voice questions like — you know, where was God in this? And think about that. You know, it's something you don't say out loud, even if you think it — in a culture that's so devout." It's a question the non-Amish here have asked, too: Where was God that day? The Rev. Kristine Hileman, a Presbyterian minister, was in a mother's prayer group the morning of the shooting. With her was Marie Roberts, the killer's wife. "It's only by the grace of God that our children go to school and come back every day," she said. "It's only by the grace of God we have another day of life. And I think that perhaps people do think about that more and say, you know, 'I have life today because God gives lets me. No place is safe except for the grace of God.' "
Hileman said that the Roberts family, lead by Marie, is staying strong and the community has embraced them. "The Amish led us in doing that by going to Charlie's funeral. You know, they stepped forward because they're a part of the community as well as she is, and of course she has done nothing wrong," she said. "Her children, they are victims just as much." This winter has been a season of introspection — a time for soul searching. In spring there is hope for renewal. The Amish tore down the school because they simply couldn't imagine reliving the horror. "I think that just about everyone that thought about thought it was a good idea," Bontrager said. "The Amish in the first week were saying, 'How could we make our children go back into that place of carnage every day and think about it?' "
But the Amish do not plan to build a memorial for the children who died, Bontrager said. "A lot of people ask me, 'Where are they going to build the memorial for these girls who lost their lives?' And they're not going to," he said. "You don't do that. You don't exalt the individual." 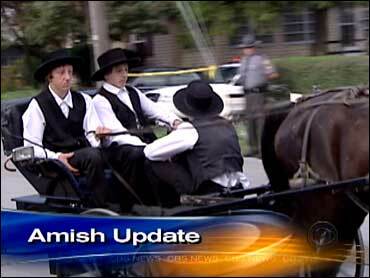 Five little girls died but five survived and for the Amish that is a blessing enough. "It's like a living memorial," Bontrager said. "The living girls, even the — the one that's injured the most seriously is, is like a tremendous symbol in their lives right now of, maybe, the providence of God." Bontrager said the Amish would take this terrible occurrence and use it to reinforce their faith in God. "The Amish would also say this is a chance for us to learn something about how to be better people," he said, "to each other, and to the world around us."